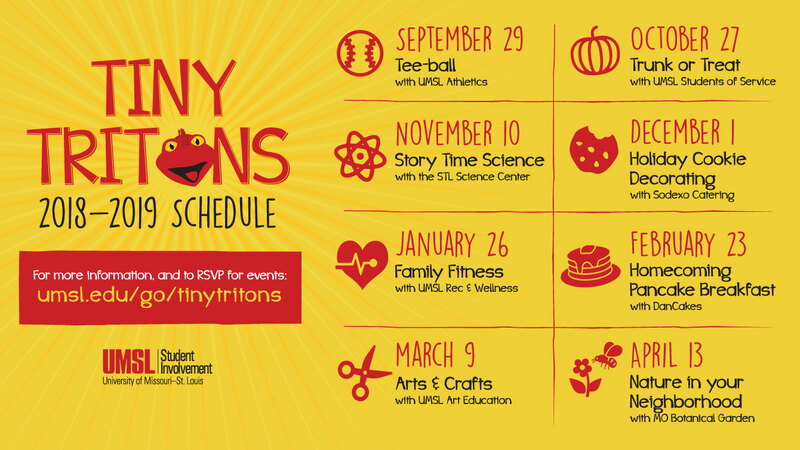 Tiny Tritons is a series presented by the Office of Student Involvement with our UMSL families in mind! With multiple programs throughout the year, these family-friendly programs are geared towards children PreK-5th Grade. Events vary from educational, physical, crafts, and just plain fun! There will be one event each month from September - April, most on Saturday mornings. Stay up to date on all things Tiny Tritons by signing up for our NEWSLETTER here, and be sure to check us out on Facebook for more information and to RSVP for events! RSVP TODAY FOR OUR UPCOMING EVENT! Who can attend Tiny Tritons? Tiny Triton Events are open to UMSL students, faculty, and staff who have young children or siblings who they wish to bring to campus events. What age range are the activities and events designed for? The events are geared towards children who are Pre-K through 5th grade. Many events are interactive and the children get to participate in making crafts or activities. Can I drop off my child and pick him/her up after the activity? All children must be accompanied by an adult. There is a maximum of 3 children per adult. No exceptions. How much do the events cost and do I have to register in advance? All of the events are free! Registration is not be required. How can I find out more info about Tiny Tritons? Check us out on Facebook to stay up to date on events! 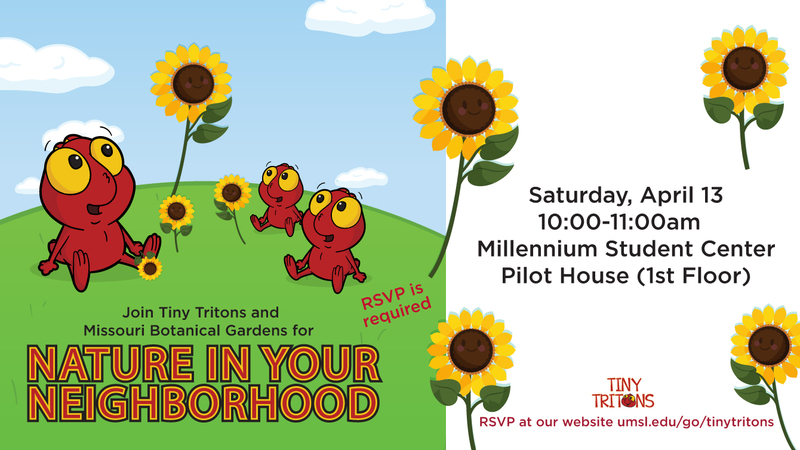 For more info, email us at tinytritons@umsl.edu or call us at 314-516-5291. What does Tiny Tritons Approved mean? Tiny Tritons Approved refers to events that are put on by other campus departments and student organizations that are family friendly and welcome children. Do you want to have your student organization event included with our Tiny Tritons Approved events? To submit an event to be Tiny Tritons Approved, please e-mail tinytritons@umsl.edu with your event details. What other resources are available to students who have children? There is a new iniative on campus called SWAP, which stands for Students Who Are Parents. Check out their events here! Interested in VOLUNTEERING with a Tiny Tritons event, or having your organization's Family-Friendly event listed as Tiny Tritons Approved? Email us at tinytritons@umsl.edu!